— BRENTWOOD — A man buying a $3 chocolate treat from an ice cream truck got an extra something with his change — a baggie of methamphetamine. It could have been an innocent mistake, according to police, but the ice cream man was arrested and prosecutors will ultimately decide if he should be charged. The 30-year-old Brentwood man told police he took a break from working on his pickup truck at about 3 p.m. Wednesday on the 200 block of Mountain View Drive to cool off with some ice cream. When he handed the suspect $20, a dime-bag size of meth was tucked in his $17 in change. After the man said he didn’t want the drug, the suspect replied he didn’t know how the baggie ended up in his truck and asked the man to throw it away, according to police. The man kept the bag and called police. Five minutes later, officers found 62-year-old Kelly Brown of Oakley and his truck at a gas station at John Muir Parkway and Balfour Road. Brown repeated to officers that he does not sell drugs, and theorized the bag of meth could have come from a customer earlier in the day. Brown was arrested on suspicion of possession and transportation of methamphetamine, both felonies. He was booked at Martinez Detention Facility. 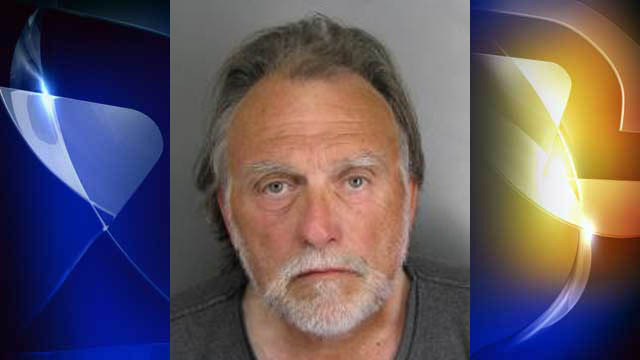 The case will be sent to the Contra Costa District Attorney’s Office for review. Lt. Doug Silva of Brentwood police called it an isolated case and said they have no reports of similar incidents involving Brown. “It’s very possible he could have accepted this from someone else,” Silva said. There were no children involved in the incident, police said. NOTE: Thanks and a tip of the hat to Lisa Fenger! 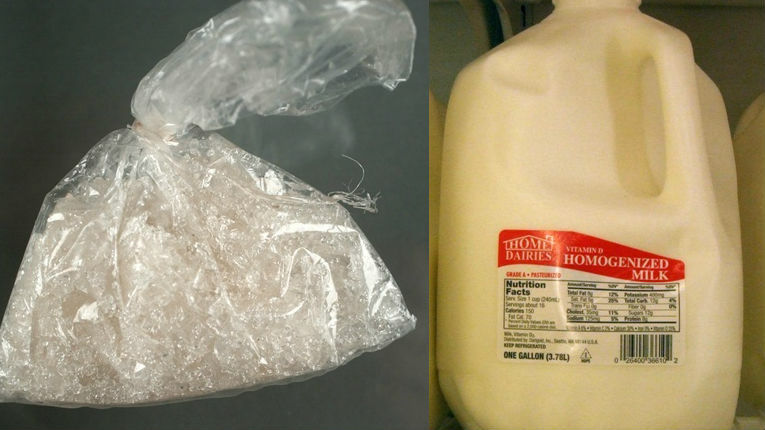 JONESBORO, AR (KAIT) – A Jonesboro man is behind bars after police say he hid a meth baggie in his milkshake. According to Jonesboro Police, during a traffic stop Skyler Sims was acting very nervous and his hand was shaking rapidly. Officer Bryan Bailey states that he’s had previous run-ins with Sims and knew he was out on probation. During the traffic stop, a K-9 unit alerted officers to a possible controlled substance inside the car. When police searched the car, they found a suspected bag of meth in Sims’ Sonic milkshake. Police tested the baggie, which came back positive for meth. Also during the search, police found two syringes, and a key chain pill container with a white powdery substance at the bottom of the container. Police say on the way to jail, Sims admitted that he had been hooked on meth for way too long and it had been a problem since junior high. Sims is charged with felony possession of a controlled substance (meth), felony possession of drug paraphernalia, and felony tampering with evidence. An Arizona mother has been charged with child abuse after police said she abandoned her six-year-old daughter at a Phoenix McDonald’s Wednesday night. Lucy Parra, 23, brought little Everlyn to the fast food eatery near 23rd Avenue and Bethany Home Road to get an ice cream, but when the girl went out into the parking lot, her mother’s car was nowhere to be found, according to investigators. Court documents show that after about 15 minutes of searching the area for Parra, McDonald’s workers called police. Parra returned to look for her child 40 minutes after she first left, while officers were on the scene. 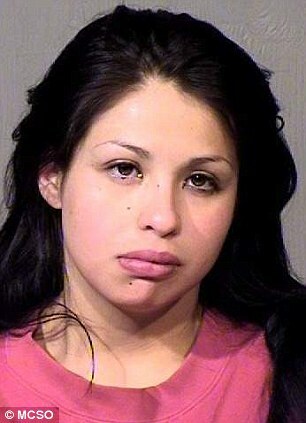 The woman, who has a history of drug problems, was arrested on one count of child abuse. Further investigation has revealed that the 23-year-old mother of five left two other kids at a family member’s home. Parra picked up her daughter from Westwood Elementary School Wednesday afternoon, even though she was not supposed to be in contact with her after losing custody of her children, according to officials. Just before 8pm, the mother took the first-grader to get a treat at McDonald’s, and then took off while the girl was inside, police said. Workers at the restaurant say the girl was crying and visibly upset at the idea of being abandoned. She also appeared very hungry. According to McDonald’s worker Yesenia Bojorquez, Everyln told her that she hasn’t eaten anything since school lunch. When Parra returned, Bojorquez said she appeared intoxicated and claimed that she has never left the parking lot, which only had four cars at the time, none of them Parra’s. 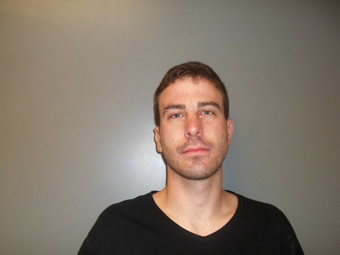 Relatives said Parra has a history of meth addiction. Two of her children live with their fathers, and her mother is the legal guardian of two others, including Everlyn. The six-year-old and the other child are now in the custody of Child Protective Services. During her court appearance, a judge placed Parra under house arrest and ordered her to wear a monitoring device after the 23-year-old said she would like to grab her children and flee to Mexico, NBC12 reported. Parra is due back in court November 28. Be careful with this cheese sauce; it’s got a kick to it. Border control agents arrested a man entering southern California from Mexico who allegedly hid seven pounds of methamphetamine inside cans of nacho cheese sauce and jalapeño peppers, according to The Los Angeles Times. A U.S. Customs and Border Protection officer at the San Ysidro crossing with Tijuana detained a 21-year-old Mexican citizen whose 1999 Toyota Solara was laden with groceries, an agency press release said. Border guards x-rayed the canned goods, because they “appeared abnormal,” according to a statement from the Customs and Border Protections office. The provisions seemed suspiciously heavy to the guards, according to an Associated Press report. In each can was a package, either covered with liquid cheese or a spicy pepper residue, Police said the drugs were valued at $140,000. The suspect, a resident of Oxnard, Calif., allegedly told officers that he traveled to Mexico to go grocery shopping. He was turned over to the Immigration Control and Enforcement agents. NOGALES, Ariz. – Authorities say a Nogales woman has been arrested for trying to smuggle 1.5 pounds of crystal meth in a can of powder milk across the Arizona border. U.S. Customs and Border Protection officers were screening pedestrians Tuesday afternoon at the Nogales port of entry when they became suspicious of a woman, whose name was not immediately released. Officers searched the woman’s belongings and found a plastic bag of crystal meth concealed in the bottom of a powdered milk can she was carrying. Authorities say the crystal meth had an estimated street value of more than $70,000. The drug was seized and the woman was turned over to the custody of Immigration and Customs Enforcement for further investigation and prosecution. DES MOINES, IOWA – A Des Moines man was charged with domestic assault Sunday after throwing a bag of Cheetos at his father. Twenty-two-year-old Patrick Hamman was arrested after the bag of cheesy chips hit his father, Michael Hamman, in the face. Police said the bag hit his father’s glasses, causing a cut to the bridge of his nose. 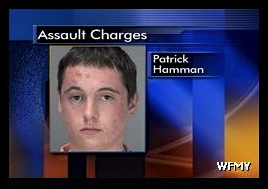 Police said Patrick, who lives with his father, admitted that he was on methamphetamine at the time of the argument.